Everyone loves free stuff. Whether it’s a follower milestone celebration or you just want to try something new, giveaways are an amazing social media experiment to try. But they’re not just a way to rack up good karma points for giving away cool swag. Giveaways provide an amazing opportunity to build your follower count, email list, brand visibility, and more. 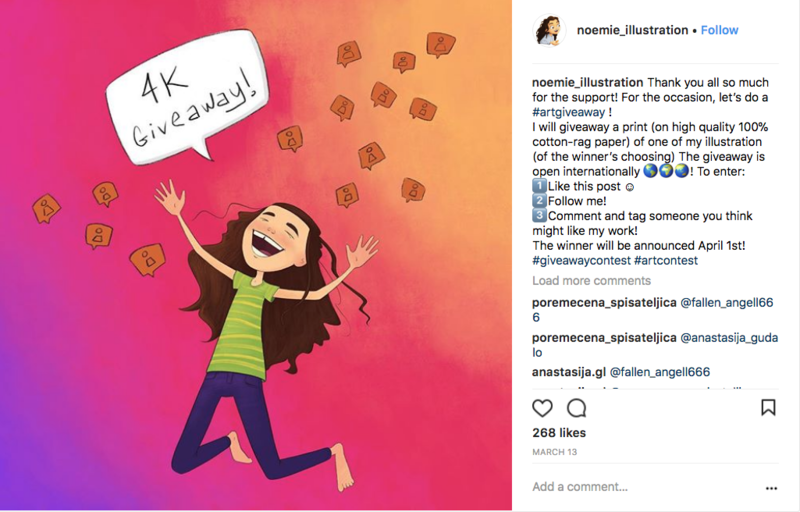 Here are a few tips on how to run a social media giveaway, what rules to include in your giveaway, how to track entries, and more. Use a giveaway to build your social media following on Facebook, Instagram, Twitter, your Artist Shop, or all of the above. Growing your email list is a great way to connect with fans, keep customers updated with promotions and news, and boost sales. You can create Facebook ads that prompt people to submit their email and you can incorporate an email signup list into your Facebook business page as well. Maybe your goal is just to get your brand out there. One great way of doing this is to have people tag several friends in the comments of your giveaway posts on Instagram, Facebook ads, etc. An example of a giveaway with 1: a cool story behind it (this is a giveaway the artist is running while they’re busy creating other work) and 2: with the perfect amount of eligibility rules (via Instagram). Quick note: Instagram requires that you mention in the description that the giveaway is not affiliated with Instagram itself. This Instagrammer didn’t do that but make sure you do! Determine the start and end date of your giveaway. This will help you better determine a social media plan for promoting it but will also help drive urgency, further encouraging people to enter. Mention the end date in the deets on social media! We’ll go into further detail under “How to actually run your giveaway”, but determine what makes someone eligible to win and be sure that it connects with your main objective. If your goal is to gain followers, one rule could be that someone HAS to be following you on the platform you’re posting on. There’s no such thing as “one and done” when you’re posting about a promotion on social media. Don’t just post once about your giveaway – talk about your giveaway regularly and consistently on social media, send out an email newsletter, perhaps run ads. Have a specific plan as far as what days you’re going to post on, how often, etc. On the other hand, there’s also such a thing as “too much of a good thing”. Find a balance so you’re not spamming the newsfeed. Before we can get to the fun stuff, each social media platform has specific rules when it comes to promotions (i.e your giveaway). Violate them and you could get in trouble with the social media police. Facebook’s Rules, for example, say that you must specify that your promotion is not sponsored, endorsed/administered by, or associated with Facebook. Instagram’s rules say you cannot inaccurately tag your giveaway post. And Twitter’s rules ask that you discourage people from getting spammy and creating multiple accounts. Read up on the rules for each platform – they will affect how you word your posts on each social media channels. 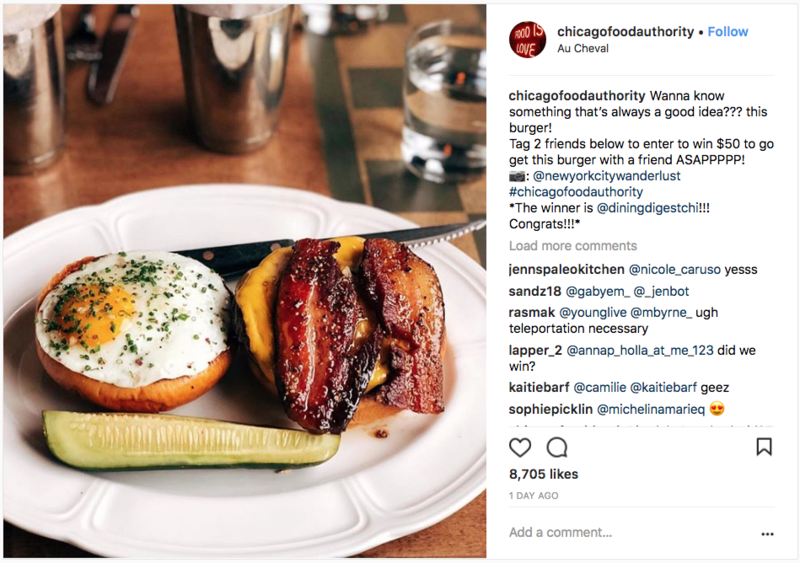 For Chicago Food Authority’s giveaway, they ask for you to tag two friends in the comments to be eligible. Quick note: Instagram requires that you mention in the description that the giveaway is not affiliated with Instagram itself. This account didn’t do that but make sure you do! Instagram is a fantastic platform for promotions. Instaguru Hilary Rushford describes Instagram as a digital magazine, a place for people to window shop. And according to Buffer, on Instagram brands receive consistent engagement with 4% of their followers; other networks (FB and Twitter), engagement is less than 0.1%. Facebook’s found itself in some seriously hot water recently. But as of February 2018, it was continuing to dominate as the most popular media platform, and it remains to be a solid resource to run ads, host your Business Page, etc. Follow: Make it so that people have to follow your account to be considered – this is a great way to grow your following. 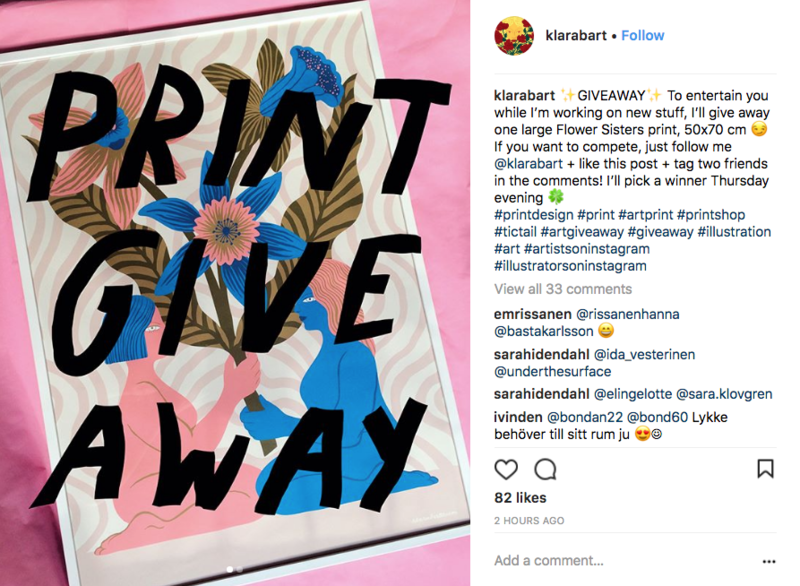 @ 2-3 friends: This is a common practice you often see in Instagram giveaways. It’s a solid way to grow your audience and visibility. Require that people comment on your giveaway post @-ing a few friends to be eligible. Custom hashtag: Creating a specific hashtag for your giveaway is a great way to keep track of people talking about your giveaway and making themselves eligible. Repost the giveaway image on Instagram: Have people repost your giveaway post on Instagram, but make sure to also ask them to use your specific giveaway #hashtag as well or to tag you in the image – otherwise it will be next to impossible to keep track of. On Twitter, ask that they retweet or quote it. Be warned – Facebook does not permit this. Sign up for emails on your FB Page: This is a great way to build your email list. Have people sign up for the giveaway by submitting their email address on your Facebook page via your call-to-action button or host a custom tab connected to your ESP (MailChimp, Klaviyo, etc). Make sure, however, that you can keep track of new emails vs existing ones on your list. Caption a design: ask people to caption a design – the winner with the best caption scores a free [insert your prize here]! Having several criteria (example – tag 3 friends AND must be following) opens up this giveaway to current followers, whereas a “follow to enter” doesn’t necessarily give you any kind of extra advantage of getting in front of new eyes and audiences. However, don’t make it too complicated or involved. I’d recommend three simple criteria tops – otherwise, it gets too complicated. This giveaway has the perfect amount of rules. They’re just simple enough to not deter anyone from entering the giveaway. Plus, it celebrates a follower milestone – finding something worth celebrating is a great way to run a super fun, positive giveaway! (Via instagram.) Quick note: Instagram requires that you mention in the description that the giveaway is not affiliated with Instagram itself. This account didn’t do that but make sure you do! Send an email to your existing email list giving them a heads up about the giveaway! If you’ve got Artist Shop customers, you’ve officially built a little email list. Find out how to access it here. Having an up-to-date and good lookin’ cover photo and About Page for your Artist Shop is always key. But you can really take advantage of them now if you haven’t already. Include a note about your giveaway in your cover image. And make sure your About Page mentions the giveaway and links to all of the social media platforms you’re running it on! A Lead Generation ad on Facebook (and therefore Instagram as well) can be tailored to gain email addresses, Page likes, etc. Try creating some ads to spread awareness for your giveaway on Instagram and Facebook. The tricky part, right? From likes to retweets to uses of your specific hashtags, there are many ways to track entries to your giveaway. Using social media planners like Hootsuite (free) or Iconosquare (not free) can make it a little easier to get a bigger picture of who’s mentioning your hashtag, reposting your giveaway photo, etc. Suggestion: stay on top of gathering new entries on your giveaway posts so that you save a little time for yourself later if it’s a long-running giveaway. You can also choose to use a tool like Rafflecopter that will keep entries well-tracked for you. When do you know to use this? Social Media Examiner suggested that if you just want to do a cut and dry “like/follow/post to win” campaign and can keep track of metrics on your own, a third-party app isn’t necessary. But more complex giveaways, you might want a tool to keep track of things for you. You can actually create a specific giveaway tab on Facebook using a tool like Rafflecopter, Woobox, or Gleam. Once you’ve compiled the entries into a Google spreadsheet or something similar, it’s time to pick a winner. If you used a third-party tool like Woobox, they might have a random selection tool build in. But if you didn’t, then your method of picking a winner is up to you! You can literally pull a name out of a hat, go to a random name picker (some suggestions here), etc. Make sure they’ve done everything you asked, too! And make sure they’re legit. If their account has no bio and two posts (that are both about your giveaway), they’re spammy, probably created another account to put in their name several times, and didn’t play by the rules – move on. When the winner is selected, keep the excitement going! Announce the winner on social media – not only will people be curious about who won (and of course for the skeptical, if there actually WAS a winner). Plus it gives the winner a little shout out and makes them feel good as well. Don’t just leave those who didn’t win hangin’ – tell them “Thanks!” People will appreciate it. Do you have tips on how to run a social media giveaway? Let us know in the comments! Featured image made by Katie Lukes. Great article! I have been running a weekly t-shirt giveaway on Twitter and I can highly recommend it. I’ve gone from about 500 to 1700+ followers over the last 4 months. Oops, I totally missed you had mentioned Rafflecopter. I guess that means I need to get some sleep. Sorry! Thank you for providing such a comprehensive, easy-to-follow explanation for how to run a giveaway. Yours is the best one I’ve found!